God is in the details, goes one saying. Another has it that it is the Devil who lives there. One way to read this is that an ontological battle is taking place in the mouse print of credit card statements and car-rental forms. Another is that the greatest challenges and sublime moments can be found in the smallest of things. Or the ones that seem to the most trivial. Like many people my first exposure to My Favorite Things was hearing Julie Andrews sing it in The Sound of Music. As much as I love Ms. Andrew’s voice the song struck me as catchy but also cute to a saccharine level. It is hard to think of a lyric not written by Andrew Lloyd Weber more treacly than this. Given that, it is also difficult for me to think of a song that — at first glance — is less-deserving of the 14-minute meditation that the great saxophonist John Coltrane gave it. But there’s a reason why he’s John Coltrane and I’m not. The great ones find, see and hear things that rest of us miss and Coltrane is definitely a great one. 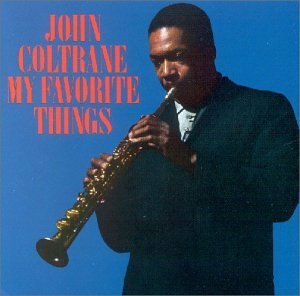 If you are not familiar with him, let’s just say that it is difficult to overstate Coltrane’s place and importance to jazz in particular and modern music in general. The arrangement is deceptively simple. The band consists of Coltrane, pianist McCoy Tyner, the incomparable drummer Elvin Jones and Steve Davis, no slouch, on bass. The song opens with bass and drums supporting the piano as it plays what later becomes recognizable as chords from the song. Coltrane and co. start the song from an oblique, but not obscure, angle. They introduce us to the song in a way that lets us set aside our preconceptions. They divorce the song from the performance most people were familiar with. They cleanse the aural palette. Not bad for the first 18 seconds. Then Coltrane starts to tease the melody apart, adding notes and pauses never there before. He starts showing us more of the depth that really exists in this seemingly trivial thing. God is in the details, playing among the motes and electrons that make up the universe. I think God laughs at our notion of size. What does He/She/It/They make of the small things that we thick aren’t worthy of our attention? I like to imagine the eternal saying, “But I am huge everywhere, even here where you cannot imagine.” If God cares for the sparrow, as the Christian scripture says, doesn’t it follow that God also cares for the microbial? Some people have argued that humanity’s complexity is proof of our importance. Who knows what infinity might think is or isn’t complex? Maybe the amoeba was the hard part, and everything after that just a mathematical or chemical reaction? For me, that’s all there in Coltrane’s dissection of the song. He takes the song as inspiration – and always returns to its key melodic phrases – but he slides away from it as well. He and his quartet find a strangeness and wonder in it. He finds a home in Favorite Things for squawks and sounds that always stop just short of discordant. Then he hands off the melody to McCoy Tyner and his piano. Tyner doesn’t produce the unusual sounds that Coltrane does but his melodic flights are just as inspired. In many ways Tyner’s playing grounds the song in our everyday experience. His playing is no less inspired but it is less ethereal. If Coltrane is playing the music of the spheres then Tyner is taking this melody of an imagined countryside and putting it into the city. Don’t just look for God among the vaults of the cathedrals and the space between the stars. God knows from gutters and deadlines and traffic. Coltrane comes back and the two mix it up. It is easy to let your ear catch on Coltrane’s sax and miss the glory of the repetition of Tyner’s chording which is more in the background. Repetition is a constant in most religious traditions – think of saying the Rosary or the Om of meditation. We need to have phrases and ideas wash over us repeatedly to lose ourselves in them. It is not glamorous but it is the essential work. And concerning work that isn’t glamorous but is essential, it would be even easier to overlook the contribution of Elvin Jones and Steve Davis. They really are creating the space between the stars. Dervishes are, of course, another religious tradition that relies on repetition. My Favorite Things is an attempt at being, for a moment, that mote in God’s eye. It lets me imagine what it must be like to see the importance of the great and small all at once.